Master bedroom with large windows overlooking the Manistee River. Master bedroom with television and river views! Captain's Quarters is brand new as of 2016! 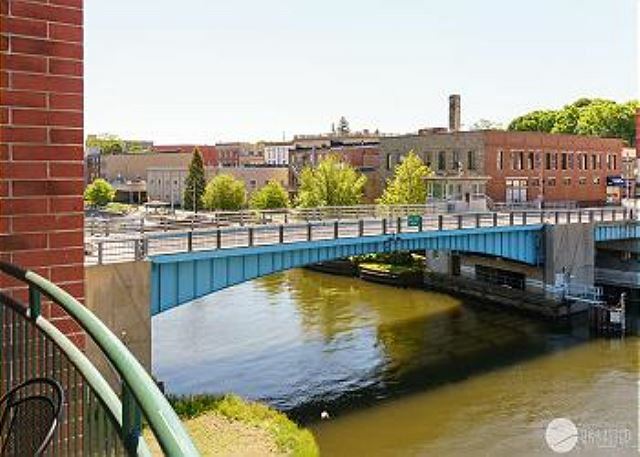 Enjoy open concept living right along the Manistee River Channel. 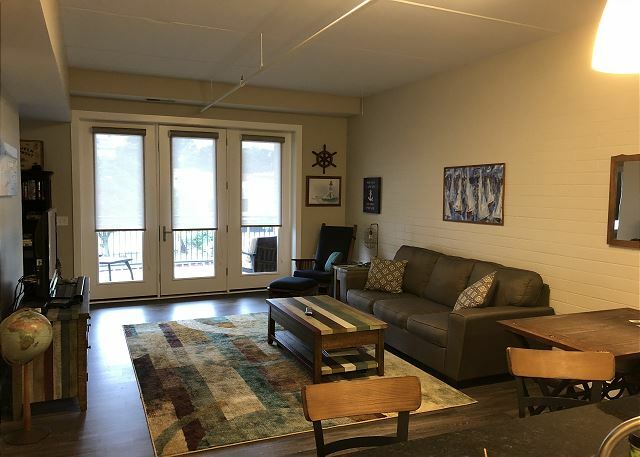 Walk in to the beautiful kitchen with large center island and then move onto the living room with large TV and access to the balcony overlooking the river. 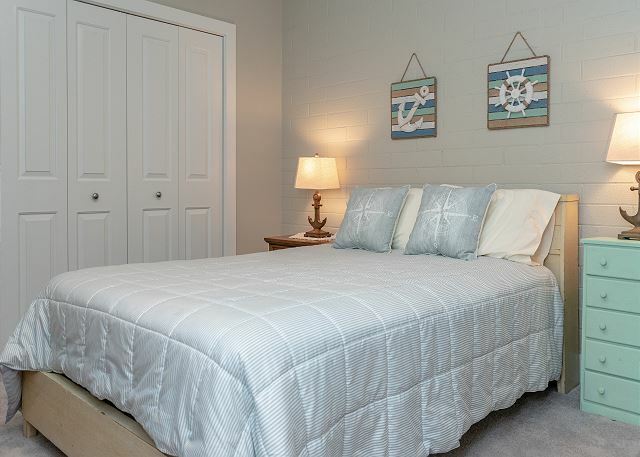 The master bedroom features a queen bed, large walk in closet, an attached bathroom with a tub/shower combo, and of course, views! 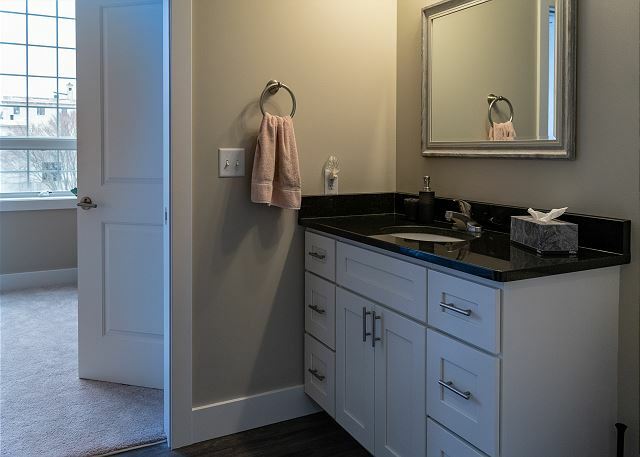 The bathroom has a door to the hallway as well for easy access for your guests. The guest bedroom has a full bed. The living room couch is a pull out with a foam mattress making the full sleeping capacity 6 people. This condo sleeps 6. All bed linens and bath linens are provided. 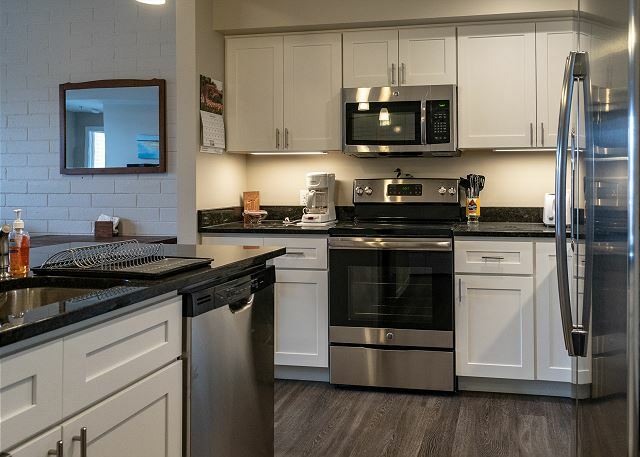 The kitchen comes fully stocked with all the supplies you'd need for your getaway including pots and pans, dinner ware, utensils, coffee maker, and all other major appliances. 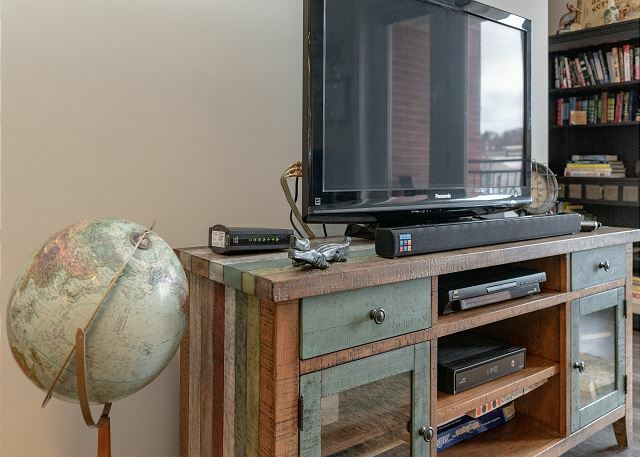 Relax on your private patio and watch the freighters come through the channel. For dinner and drinks, head to the new brewery around the corner or cross the bridge into downtown and hit the restaurants and pubs. Downtown Manistee also features boutiques, clothing stores, and a theater. Be sure to walk the river walk down to the beach (about a mile). 5th Avenue Beach is just a few minute drive away and it's a great spot to relax and play by Lake Michigan. Also close by are Little River Casino and the beautiful Arcadia Overlook. This rental was very clean, modern, and had a great view. I would definitely recommend it. Very relaxing! Beautiful view and condo was very clean! Living room furniture a little uncomfortable but the balcony furniture was great! Loved waking up and watching the boats pass by! The condo was very nicely decorated and everything seemed brand new. The location was great because you could sit on the porch and watch the boats coming and going as well as walk to downtown and the lakefront. We had a problem with parking that was rectified immediately by the staff. Will use them again on out western Michigan vacations. A problem occurred with the rental and I was upgraded to a larger condo for no extra charge and no hassle. Excellent service and a beautiful space. Started off not having a river view unit which we thought we had booked and a constant leak from the ceiling fan in the bathroom. But Unsalted was extremely helpful. They moved us the next day and they had to bring in extra cleaners to get the new unit done. Can’t tell you how nice it was to work with them and all this on a weekend when they are closed. Would definitely use this company again. Thanks Charlton. We appreciate you being so understanding when the issue arose and we were glad we could get you in to a different unit and that it ended up being great for you and your vacation. Please keep us in mind in the future. Well built and appointed, assistance readily available, nice view and patio, surprisingly quiet. Hi Barbara - thanks so much for taking the time to review your stay, we're happy you enjoyed yourself and we look forward to your next visit!